Souvlaki Street in London is the place to be for a taste of Greece — and the lines that span down the roads where it is set up are proof! Started by Evi Peroulaki from Vatolakko who went to the UK to study in 1997, Souvlaki Street was never in her plans, but became a passion, as she explained to Flashnews.gr. With authentic ingredients, many from Chania, along with freshness as a priority, Evi and her British partner, Phillip, dreamed up the idea to provide tasty Greek food for the many expats living in London. One day Evi showed up at the local market with enough food to make 40 skewers of meat and it was a success. 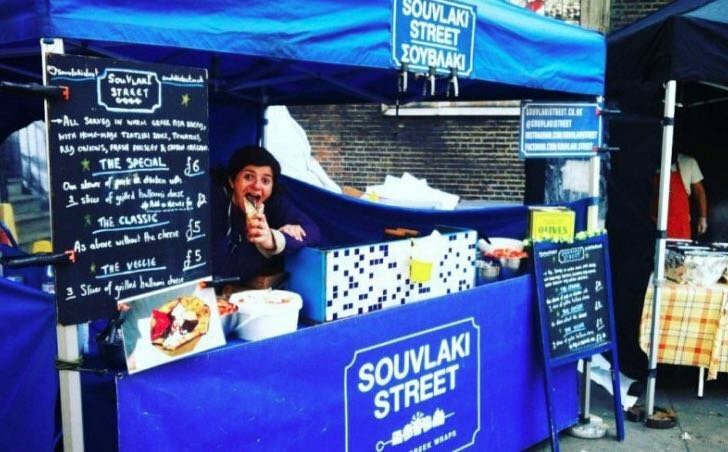 Now the pop-up food stall known as Souvlaki Street is an institution for central London’s City, Shoreditch, Victoria, Canary Wharf, South and East London! “From the start we had a great response from English and Greeks. When we started in 2014, we were among the first mobile souvlaki in London and many people did not know what souvlaki was,” Evi told Flashnews.gr.